Scientists in the US have shown they can extend the lifespan of aluminium–air batteries by displacing corrosive electrolytes from their electrodes with oil when the battery is on standby. 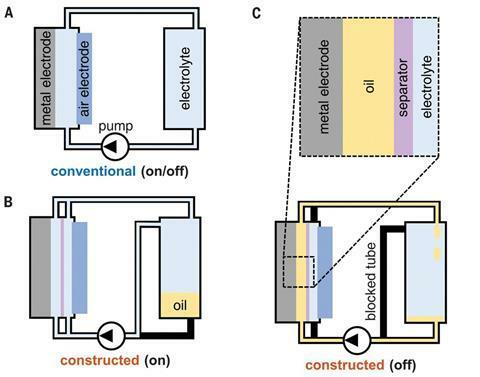 Single-use aluminium–air batteries are much less expensive and more compact and lightweight than rechargeable lithium-ion batteries. However, once turned on, an aluminium–air battery starts to corrode. If you leave it sitting fully charged for a month, it will lose 80% of its charge over that time. Lithium-ion batteries have a self-discharge rate of just 5% a month. After draining a battery, remaining electrolyte clings to the hydrophilic aluminium electrodes, causing corrosion and a dried crust of byproducts and electrolyte solutes. Now, scientists at Massachusetts Institute of Technology say they have solved the corrosion problem in aluminium–air batteries. The researchers found a hydrophilic PTFE (polytetrafluorethylene) separator for between the battery electrodes that displays underwater oleophobicity, which means that when immersed in water it will repel oil. The aluminium also naturally exhibited underwater oleophobicity, though this was expected. Both surfaces simply like to be wetted more by electrolyte or water than they do by oil, Hopkins explains. The researchers turned the new aluminium–air battery on for five minutes then left it to sit for a day or two. They then turned it back on again, and repeated the procedure until the battery ran flat. The conventional battery lasted three days, says Hopkins, because of corrosion, whereas the new design lasted 24 days. This equates to it being 420% more energy dense, though this depends on how you use the battery. ‘For certain applications, aluminium–air would be better than lithium-ion and zinc–air for example because the aluminium–air is so much more energy dense and very low cost,’ says Hopkins. ‘Aluminium–air is competitive for applications that require really lightweight, compact batteries that you don’t necessarily have to electrically recharge.’ Aluminium–air batteries can be reused by mechanically replacing the aluminium in them.